Just wanted to share with you some very exciting news! I’ve been trawling through my harddrive this afternoon trying to find a picture I took about eight years ago. I didn’t find it, but I did find something pretty amazing: a folder entitled “My fantasy-adventure book” with seven files in, which turn out to be the long-lost documents I wrote back in the day for my fantasy story! Amazing, huh?! And that’s exactly what I’ve been doing for the past hour. I’ve written precisely 732 words for my story, but have decided I’d best leave it for now as I feel another headache coming on. But still, I’m impressed! I’ve already written some Star Wars short stories, of course (here, here and here), but this feels different, at least somewhat. For one thing, I’m now writing in my own world, and that has been so much more difficult than I thought it would be. I’m writing what I have been thinking of as “middle fantasy” – it’s not low fantasy, as far too much craziness happens as a matter of course, but it’s not high fantasy, because there are a lot of reasonable, earth-bound things that serve to (hopefully) ground it. Anyway, no matter what height of fantasy, the world needs rules, and it has taken me a couple of weeks of (almost) constant thinking about to decide what I’d like the place to be like. I’m not expecting this to be some sort of earth-shattering fantasy epic that will change the lives of billions forever – indeed, I constantly refer to it as “my fantasy story” because the thought that it might be a novel, let alone a novel series, terrifies me – but instead I actively hope that the procession of common tropes will make it accessible for many, and perhaps even enjoyable to a few. Anyway, I might make this a thing, so stay tuned for (possibly) more updates soon! So this pair turned up on my doorstep today (not like this, of course – packaging was involved). But it’s very exciting, all the same – the first Star Wars novel to be published with the ‘Legends’ banner, and the final adventure deck in the Rise of the Runelords adventure path for Pathfinder Adventure Card Game. And it’s the Pathfinder thing that’s been on my mind a lot lately. You may recall my somewhat lukewarm opinion of it from back in the day? Well that has been changing quite dramatically of late. While it’s still no Lord of the Rings, I’m finding myself drawn into the whole Pathfinder universe much more than I ever have been previously. Last night I spent some time with the core rulebook, though it’s such a massive tome that I didn’t get very far. That said, I am definitely feeling in a RPG mood nowadays. On Saturday I found myself looking over some of the old d20 Star Wars web supplements I have, and felt a huge rush of excitement at seeing all the tools we have with which to make our own heroes, our own adventures, and our own worlds. That’s something that I hope to delve into again soon, as it’s been far too long since I’ve run a RPG campaign. All of this has got me thinking about some ideas I had for a fantasy story back in 2006/7, when I spent some idle summer afternoons in work jotting down ideas as they came to me for interesting names and situations. I tried to thread them into a story back then, but short of about a hundred words in a now-lost Word document, I haven’t really done anything with them. Fortunately, however, I never throw anything like that away, and when I recently moved house I found a lot of my notes that I made. While it’s not going to impact on my Star Wars writing (hopefully! ), I am now intending to make something of all these odd jumbled notes, and once something has been finalised, it will pop up here for you to enjoy (or not, as the case may be!). It’s Tuesday, so that means it’s game day here at spalanz! Today I’m going to do a small blog on a game expansion, largely because I have an exam tomorrow and need to keep the little grey cells ticking over on that. 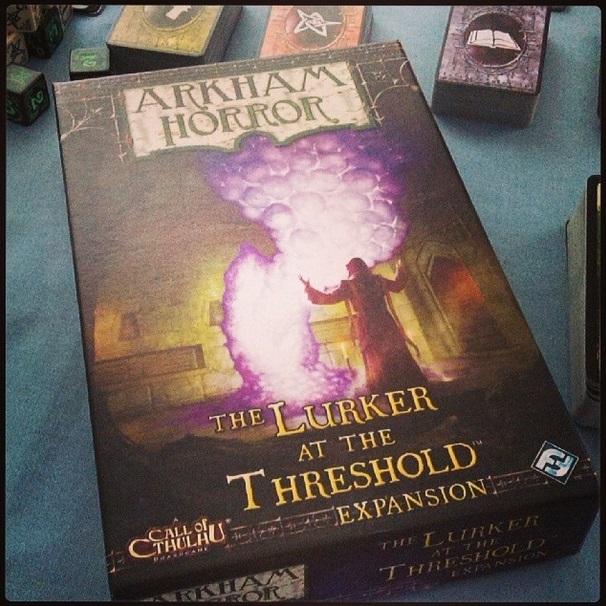 So following on from Arkham Horror last week, I’m going to take a look at ome of the smaller expansions, The Lurker at the Threshold! Chronologically the penultimate expansion for the game (not counting revised editions), the Lurker was the final small box released. 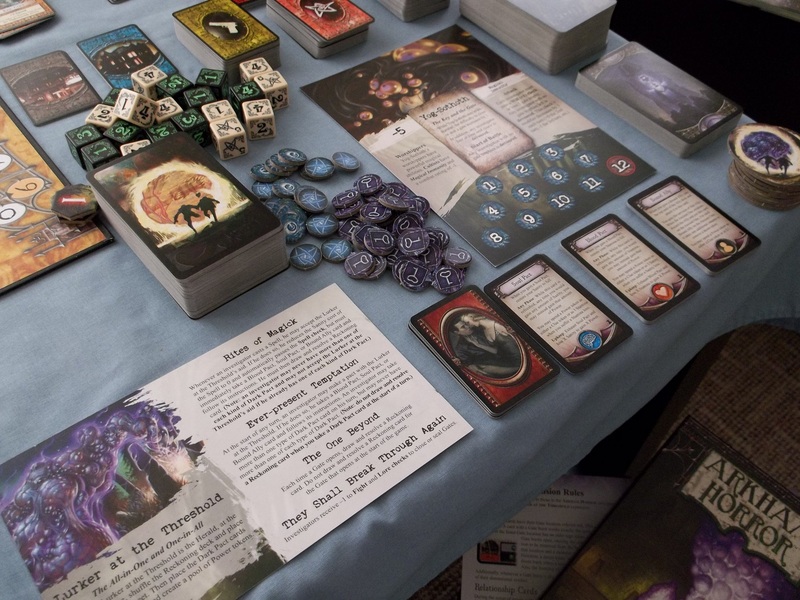 Each of those expansions is closely associated with a particular Ancient One from the base game, and Lurker is aligned with Yog Sothoth, a being who transcends time and space. Within the mythos, the Lurker at the Threshold is an avatar of the Ancient One, and the “collaboration” between Lovecraft and August Derleth explores this. …great globes of light massing toward the opening, and not alone these, but the breaking apart of the nearest globes, and the protoplasmic flesh that flowed blackly outward to join together and form that eldritch, hideous horror from outer space, that spawn of the blankness of primal time, that tentacled amorphous monster which was the lurker at the threshold, whose mask was as a congeries of iridescent globes, the noxious Yog-Sothoth, who froths as primal slime in nuclear chaos beyond the nethermost outposts of space and time! The expansion includes all-new cards for the base game. In addition to new spells and items, there are also several new decks. Firstly, there is a Relationship deck, which provides a relationship between you and the player to your left. These often provide bonuses or other special effects to emphasize the cooperative nature of the game. The other decks all interact with The Lurker himself, a new Herald that follows on from those first introduced in Dunwich Horror. The Lurker appears to be something of a benevolent force, providing help to the investigators almost as if he were a Guardian. However, it is help that comes at a price. 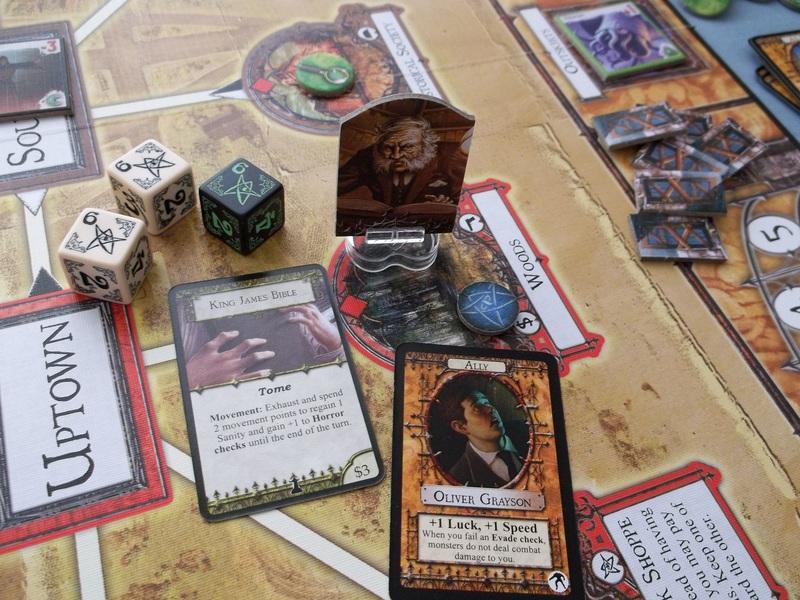 If the investigator accepts the aid of the Lurker, he must then take a Dark Pact card (seen below the Ancient One sheet in the above picture); of themselves, these Pacts also seem to be quite helpful, offering you the alternative of accepting power tokens over losses to sanity, or indeed to spend in the place of clue tokens. Unfortunately, the other deck associated with the Lurker is not so welcome. The Reckoning deck (the cards to the right of the Ancient One sheet above) comes into play whenever a gate opens. Reckoning cards function with varying degrees of hindrance to the investigators – from causing you to move to an Other World, to forcing the discard of clue tokens or the loss of sanity or stamina, based on how much power you have amassed. It’s very fitting, and ties nicely into the special abilities of Yog Sothoth from the base game, with whom I would only ever play this expansion. Harvey Walters knew there was something lurking on the threshold of time and space, though his research at Miskatonic University had failed to uncover any real clues. How could he know it was Yog-Sothoth, waiting to devour the town of Arkham? Making a deal with renowned gangster, Michael McGlen, he determined to conquer the other worlds and find the clues necessary to piece together some form of defense for this town. The two men split up early in their quest, Harvey heading downtown while Michael focused his search on the Uptown area. By a strange twist of the mythos surrounding Arkham, both men found themselves switching places, and gates to other dimensions and worlds began to blossom like the petals of a rose. The hunt was on! 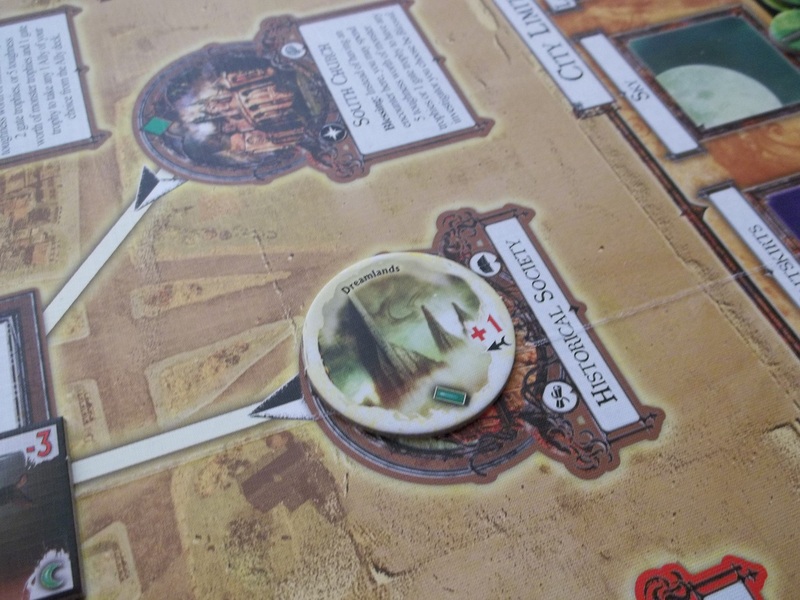 Harvey Walters, disturbed by the rising level of terror in the town, was furiously gathering clues from every corner, and using his eldritch wisdom to seal gates once he had explored them. His years at the University had taught him a thing or two about spell-casting, and his facility with the Sigil of Hermes Trismegistus gave him an edge in his battle with the occult powers swirling through the town. His exploits had earned him enough renown that, stopping through Ma’s Boarding House, he earned the help of his fellow academic Oliver Grayson, who offered to lend his own knowledge of the occult in the quest against the Great Old One. Alas, terrible news soon reached the pair of professors. Michael, while remaining with his allies at the Black Cave, had twice been sucked through portals to other dimensions, and yet both times had managed to see himself returned safely to Arkham. However, it was on his way back from the Plateau of Leng that catastrophe struck. By a cruel twist of fate, his luck ran dry and the gangster was lost in time and space – the very realm of Yog-Sothoth. The worst was presumed, Michael had perished in his attempt to return one final time to this world, and it can only be assumed that his companions also perished in the void. Harvey and Oliver were on their own. It was now that Harvey began to give in to temptation. His eldritch knowledge had made him aware of a presence, a Lurker on the Threshold of time and space, that could perhaps help him as he made a final push to liberate the town of Arkham from the pall of the Great Old One. With a copy of the King James Bible for some measure of comfort, if not protection, Harvey entered into a Soul Pact with the Lurker. After a fight with a dreaded Cultist, during which he contracted a Blood Disease, Harvey further gave in to the Lurker’s promise of power by making a Blood Pact with the fiend. Whether he shared this with Professor Grayson or not is unclear. The two professors now made a last-ditch attempt to seal the gate to the Plateau of Leng, perhaps doing so in memory of their fallen comrades. 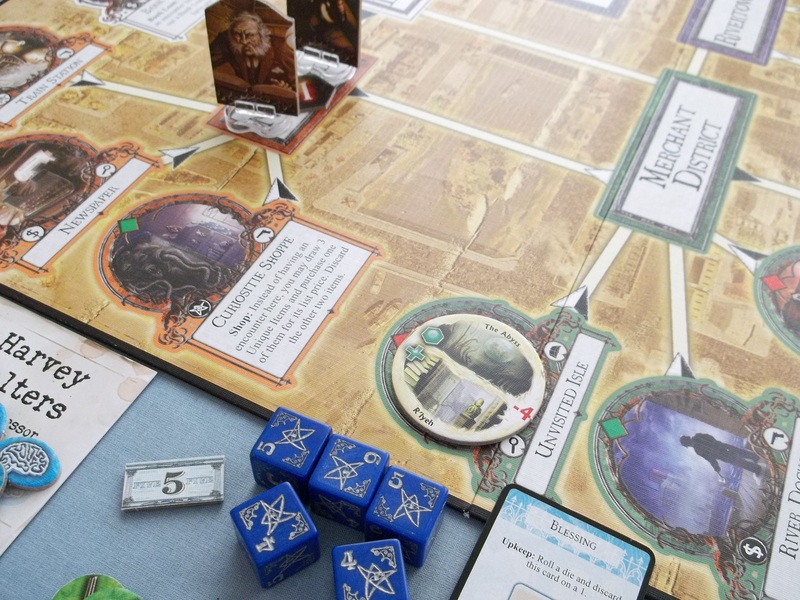 Harvey immediately used his arcane gifts to Find the Gate back to Arkham, and with all of his knowledge combined from the clues he had amassed against the coming of Yog-Sothoth, managed to seal the sixth gate through to the other world. Nobody rejoiced in Arkham that night. Nobody would ever know that they had come within terrifying moments of being plunged into the horrifying abyss.